Crispy and crunchy Sabudana Chutney Balls make a perfect tea-time snack that taste delicious and is full of flavor. Serve alongside with green chutney to tantalize your taste buds and enjoy. and above all, it’s gluten-free and vegan! 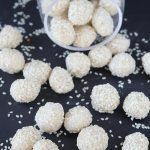 Be any fasting occasion, sabudana also referred to as tapioca is one of the most popular comfort food because they are light on the stomach, easy to digest and provides energy. 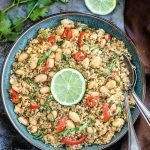 It’s a very versatile ingredient which means that you can play around with it in all kinds and still create interesting recipes. Sabudana chutney balls recipe comes together in a jiffy. It is not limited to fasting period and can be relished as a tea-time snack too. First step involves soaking of sabudana pearls. If your soaked sabudana turns mushy or sticky then follow this link to a step by step fail proof recipe on how to get non sticky sabudna pearls every time. Secondly, prepare vrat ki green chutney and boil potatoes. Make sure chutney is thick and contains no liquid. To be sure, sieve chutney through a strainer to remove all the liquid. All that will be left behind will be a thick paste of green chutney. Combine soaked sabudana along with mashed potatoes and spices to form a dough. Make a ball out of the dough, flatten and stuff a teaspoon of chutney in the center. Roll to form a ball. Now deep fry the sabudana balls. 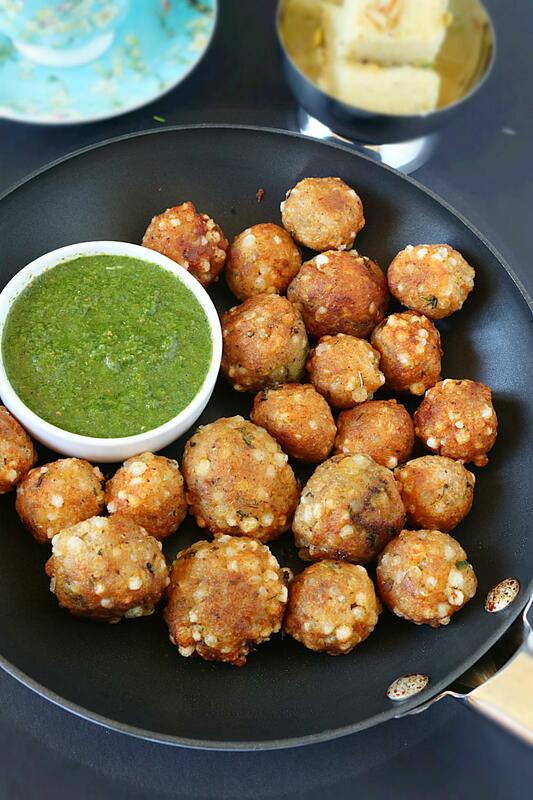 For a healthier option, cook chutney balls in an appe pan until crispy and crunchy. Serve along side vrat ki chutney and enjoy! Yes, you heard it right. Sabudana chutney balls is a perfect make ahead appetizer. Stuff, shape and store them in your refrigerator. When ready to eat, fry them in hot oil or cook in appe pan and enjoy! If you happen to make these then either drop me a line below or share your yum pictures with me on Facebook. Would love to see your creation! Crispy and crunchy Sabudana Chutney Balls make a perfect tea-time snack that taste delicious and super yum. Serve alongside with green chutney to tantalize your taste buds and enjoy. Soak sabudana as mentioned in the link above. Press in between fingers to check it is soft. Set it aside. For chutney combine all the ingredients in a blender. Pulse until smooth. Taste and adjust salt. Make sure chutney is thick and contains no liquid. To be sure, sieve chutney through a strainer to remove all the liquid. All that will be left behind will be a thick paste of green chutney. Set it aside. Combine mashed potatoes and sabudana in a bowl. Add cilantro leaves and spices and mix until it forms a soft dough. If the dough feels sticky add a tablespoon of Kuttu flour ( buckwheat flour) and mix until well blended. Divide and shape the dough like small balls. Place a teaspoon of thick chutney in between and roll it like a ball. Repeat with rest of the balls. Fry on medium heat until crunchy and crispy. For healthier option you can cook it in an appe pan. Crunchy and crispy Sabudana chutney balls are ready. Along with green vrat ki chutney.